Since the April 4th 2017 chemical attack on Khan Sheikhoun a number of individuals and organisations have attempted to promote narratives that promote the idea that the attack was a false flag. One prominent voice stands out among these individuals and organisations, that of Professor Theodore A. Postol of the Massachusetts Institute of Technology (MIT). Professor Postol was previously known for his work with the late Richard Lloyd on the August 21st 2013 sarin attacks in Damascus, claiming the White House version of events was false, with Postol in particular attempting to point the finger of blame at rebel groups. His status at MIT has made him particularly popular with conspiracy theorists who cite his work and credentials when promoting their false flag theories around the attack. With the latest attack in Khan Sheikhoun Professor Postol has returned to the fray, publishing a series of reports claiming to show the version of events as described by the White House is false. This has yet again drawn much positive attention from conspiracy theorists, and even a small amount of mainstream attention. The French Government has released a report that totally contradicts the already dubious allegations in the WHR. It is quite clear that Postol believes the attack on Saraqeb (Sharaqib) occurred on April 4th 2017. However, this is an error both enormous and incredibly basic, especially when it’s the core premise of a report that attacks the “WHR” in such strong terms. This intelligence on the process used by the regime, which is a sign of its responsibility in the attack on 4 April, is based notably on the analysis of the content of an unexploded grenade which was used with certainty by the Syrian regime during the Saraqib attack on 29 April 2013. That mid-afternoon, a helicopter arriving from the north-east flew over the city of Saraqib at high altitude. Three unidentified objects, emitting white smoke, were dropped on neighbourhoods to the west of the city, on a north-south trajectory. The presence of the same chemical compounds in the environmental samples collected during the attacks on Khan Sheikhoun on 4 April 2017 and on Saraqib on 29 April 2013 has therefore been formally confirmed by France. Despite the date of the Saraqeb attack being stated to be April 29th 2013 in the document twice, even in the same paragraph providing the details of the attack Professor Postol used in his report, for some reason Professor Postol clearly believes the Saraqeb attack occurred on April 4th 2017, and uses this to attack the White House report, and by association the widely accepted narrative around that attack, “that a fixed wing aircraft was the originator of the airdropped munition at the alleged dispersal site”. This error is so basic, especially considering it’s a short 6 page report with the date mentioned twice, that it’s quite incredible that anyone, especially any academic, would make it. In a case as serious as a sarin attack one would hope for some basic fact checking, especially when one is attacking official government reports and making allegations that support claims of false flag attacks. One can only hope Professor Postol’s future reports will have a higher level of professionalism, which would be expected from a professor at the Massachusetts Institute of Technology, lest he ends his career as another conspiracy theorist babbling on fringe websites. Ok, so who attacked Idlib? It is not likely that Assad ordered this, so who did? I’m certain that the crater and the rusty junk in the crater are nothing to do with any chemical bomb, so that leaves only one suspect. Detailed photo of the filling caps on those Soviet chemical bombs. Not the same at all, also has a raised dimple in the centre circle. Khan Sheikhoun cap, clearly not the same. That cap is similar in appearance to a commercial gas cylinder, reinforced neck rink, that has a plug inserted in the threaded opening. Neck rings are located on the top of gas cylinders. Here’s a photo of a typical gas cylinder neck ring without the plug inserted. 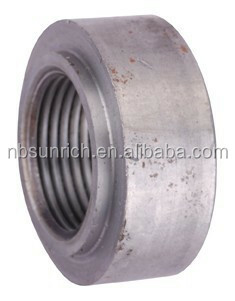 Note; There are lots and lots of different types of gas cylinder neck ring designs. Also, chemical ordnance filler assemblies/plugs look similar..
One more key component shown in these photos that hasn’t been seen or discussed yet. If you look closely at the half shell/casing you will see a metal bracket mounted on the inside portion of the casing skin. This metal bracket runs down the length of the casing half shell and is aligned with where the casing has been cut. It would be nice if there was a photo of the other side/inside of the casing to determine if this bracket runs the full length of the casing. Based on my knowledge of ordnance, there are only two reasons that I can think of, at the moment, for this bracket to be located in this position. – Reason #1; Conduit/internal plumbing to connect the nose/tail fuze wells to a charging well for fuze arming. – Reason #2; This bracket is used to house a cutting charge such as a linear shaped charge. The linear shaped charge would be seated in a grove in this bracket that is in contact with the internal casing skin. The cutting portion of the linear shaped charge would be facing outward. If the other half of the casing is found it should also have the same bracket mounted to the internal portion of the skin (note; I’ve never found a ordnance casing half shell, with this type cutting charge/bracket, where the bracket wasn’t still attached to the half shell). — Typically the way this works is; #1; The fuze functions, #2; A lead charge that is mounted in a manifold assembly, which is located in the forward portion of the ordnance item, is initiated, #3; The lead in the manifold assembly initiates all the linear shaped charges (typically two, three, or four pieces/lengths of linear shaped charge). #4; The linear shaped charge sections cut the skin of the ordnance into two or three nice, cleanly cut, linear pieces of casing. Also, in some ordnance items there is another section of linear shaped charge that cuts the tail fins free with a nice clean cut. From this angle one can see that on the same bomb used by HRW in its graphic, the inner circle of the filler valve is actually depressed below the level of the outer circle. Literally the opposite of the cap found in Khan Sheikhoun. Good find. Yeah, I agree that we have to consider that those museum pieces are embellished/repainted: the labels “Sarin” “Soman” and “VX” probably don’t reflect their original payloads. IMHO the photo of the filler assembly is showing the inside the bomb portion of this component. To make a true comparison to KhAB 250 filler assembly would require some photos of the other side (someone needs to turn it over and take some pictures). It looks like the filler assembly (bottom side in the photo) still has some casing material attached. I imagine if you turn this filler assembly over you will find that the outer flange of this filler assembly is welded to a small piece of the fractured (due to an explosive event) ordnance (or what ever this item is/was) casing. No it isnt. That’s not any kind of valve assembly, it’s a solid cap. Yep, I never stated it was a Valve Assembly”. Key words “filler assembly” and it appears to be welded to the casing as I assumed it would be. A filler assembly for chemical filled bombs/ordnance would generally included a female component mated to the casing by welding (prevents leakage) and a male component to plug the filler hole/opening in the female component. Note; IMHO a gas cylinder neck ring is not a valve assembly but a component that will accept installation of male threaded “valve assembly” or a “Male Plug”. Right, the point is we don’t know what it is, but it definitely isnt the valve assembly of a Soviet chemical weapon as depicted by HRW. Obviously we can speculate all day on what it might be. First time I seen that photo, do you have anymore? Good observation, it’s definitely not a match for the KhAB 250 “Filler Assembly”. It sure looks like this component (plugged filler assembly?) was on the front end of whatever caused that crater. Note; It looks like the external portion of this component (located on the outside of the casing) is packed with asphalt/dirt and the backside of this component (inside the casing) is clean. This may be one of the reasons it was found in the crater. Not sure if this is the best place to ask this but I couldn’t find a better one. All this Postol business about craters and explosives being detonated ‘from the top’ because the remains looked ‘squashed’. Now that looks as if it’s been squashed down too, but I am not aware that anyone has tried arguing that’s not REALLY a rocket. A similar image appears in the Postol /Lloyd report. Page 11 figure marked 21. It looks to me as if the squashed look isn’t terribly unusual . Thoughts? Where’s a good source for this type of image? My thoughts run along similar lines. Based on the early pictures and the minimal remains from the munition , I can see why Postol came to the conclusions he did. However , given that he suggested that the munition was most likely made from a 122 mm missile , the obvious analogy would be the Ghouta munitions. I think we may be looking at something similar , if not exactly the same , as those Ghouta rockets , only we haven’t seen the identifying remains , like the tailfins , that would confirm the I.D. It seems like the end-cap is appropriate in size for a 122 mm tube , if you assume , as I do , that the piece of metal projecting to the side is simply a torn piece of the missile tube that was blown out , remaining attached at the weld area of the end-cap. I don’t see anything that makes me think the munition is 2-3X bigger in diameter than a 122 mm tube , as you’d see if it was one of the suggested Russian chemical bombs. So , most likely , a Volcano-style rocket launched from a couple km away – IOW , from rebel territory. Yeah , truthfully , the piece of metal at KS looks more like a piece of mangled guard-rail than anything else. Compared to the voluminous debris from Ghouta , at KS once you get past the end cap/filler cap piece there’s not much to see that you can picture as part of an intact munition. Not without some imagination , anyway. I just noticed for the first time that inside bracket mentioned by grouper 42 above. Seems like a decent chance that might lead somewhere. Well (Marko) you’re taking that much further than I would. But I look at the deformation of the earlier devices and the deformation of this device and am absolutely NOT reaching the conclusion that the KS one must have been deformed by an explosive placed on top of it – as lot of previous devices show similar deformation. So I can’t see – unlike you – why Postol came to that conclusion. (Although if you read his first piece there’s not really a *conclusion*, lots of ifs and maybe caveat statements). A Bellingcat contributor has also noticed the cap doesn’t match the one on the bomb. which cap? the one on the bomb isnt actually a cap, its a valve. This is like a patient with no medical training trying to tell his doctor how to perform his triple bypass. Nice narrative. Except for the wind direction. So, it’s “bellingcat vs. laws of physics”. Are you serious? Can you help me see where he even talks about wind direction?